Quietude is an ecology of jewellery products and accessories that enhance the experience of deaf women in a sound-oriented world. The accessories detect sounds and translate them into shape changes, light patterns and vibrations. Wearing the accessories, the deaf women can perceive sounds through their body. Quietude addresses a number of needs of people with hearing impairment, from functional needs like ambient awareness, to hedonic needs like aesthetics. In most commercial medical aids, the “functionality dimension” frequently overcomes social, cultural, psychological, aesthetic factors which are fundamental to address the experience of accessorizing and clothing the body. Quietude aims at balancing the tension between a functional approach to disability with an ethical and aesthetic exploration of technologies supporting disabilities. Quietude collection is composed of three necklaces with different behaviours: shape change, dynamic light and vibration. The suite of accessories is a modular system of interactive jewellery which can be configured in different forms and on-body use. Materials include fabrics, leather, felt and recycled plastic in combination with CAD/CAM, 3D printing, laser cut and engraving. A smartphone application completes the system allowing personalisation of both sound recognition in input and kinetic transformation, light and vibration in output. 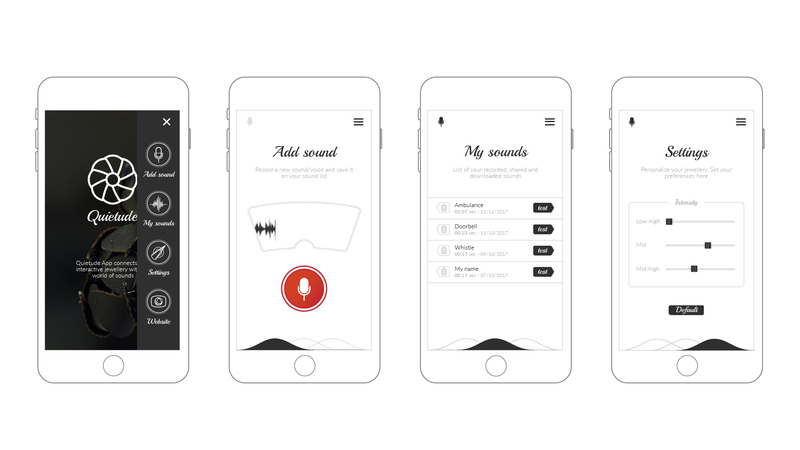 The app allows the construction of a personal library of sounds that can be monitored for, and replayed on demand through the accessories. Quietude was designed and developed by a multidisciplinary team coordinated by Santa Chiara Fab Lab, University of Siena. Core team: University of Siena, Glitch Factory, T4all. In collaboration with University of Southern Denmark and Siena Art Institute. FutureFest, by Nesta, is one of Europe’s largest festivals of the future – exploring ways to shape a better future through immersive experiences, debates, installations and inspiring talks. 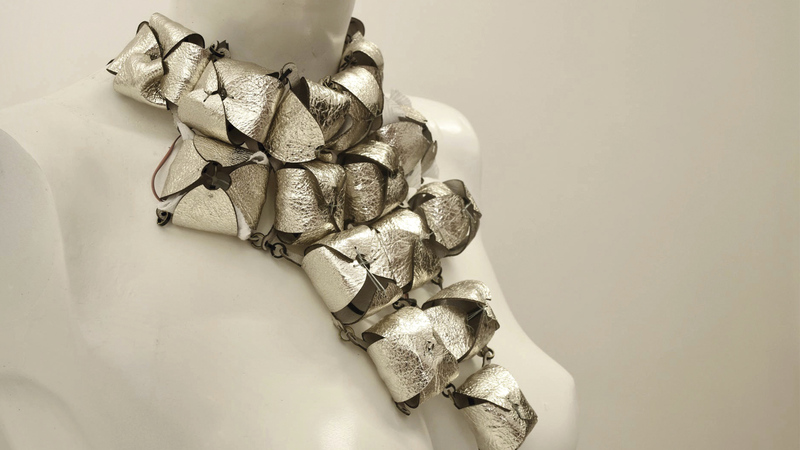 Marti, P. Iacono, I. and Tittarelli M. “Experiencing sound through interactive jewellery and fashion accessories”. Proceedings of the 20th Congress of the International Ergonomics Association, 26-30 August 2018, Florence. 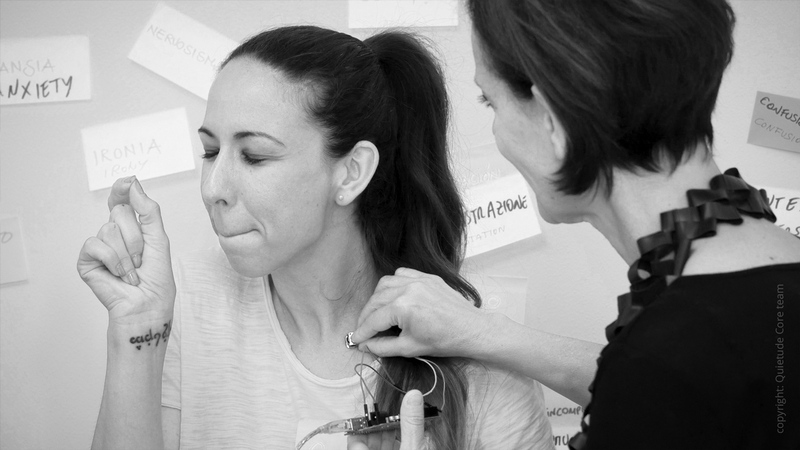 Wilde, D. Marti, P. Exploring Aesthetic Enhancement of Wearable Technologies for Deaf Women. Proceedings of the ACM SIGCHI Conference on Designing Interactive Systems (DIS 2018), 9-13 June 2018, Hong Kong.